Though in Yucatan, this dish is made by hollowing out a 2-pound Dutch Edam cheese, filling it with the pork picadillo, securing the cheese "top" back in place, then poaching the whole affair until the cheese softens slightly, it's a complex procedure that yields a dish that, though very delicious, is hard to make look beautiful when served. So I've recast the classic, using a meltier, more accessible cheese and easy way to serve the delicious combination of flavors. The tomato sauce. In a blender, smoothly puree the tomatoes, onions and chiles; if using fresh tomatoes, add about 1/2 cup water to help get the blending started. In a large (4-quart) saucepan, heat the lard or oil over medium. When hot enough to make a drop of the puree sizzle, add it all at once, along with the epazote, then cook, stirring regularly, until as thick as tomato sauce, about 10 minutes. 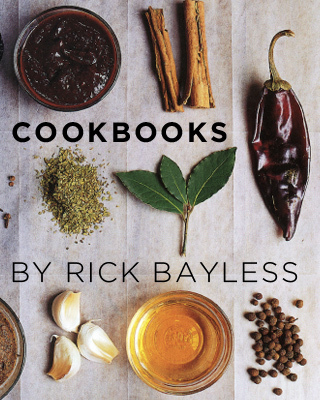 Taste and season with salt, usually about a scant teaspoon. Scoop about 1 1/2 cups of the mixture into a small dish and set aside to use in the picadillo. The pork picadillo filling. Set a very large (12-inch) skillet (preferably non-stick) over medium heat. Crumble the pork into the skillet, then measure in 2 1/2 cups of water. Add the garlic, allspice, black pepper, cloves and 1 teaspoon salt. Cook at a gentle simmer, stirring occasionally, for 20 minutes. Pour the mixture into a strainer set over a bowl. Return the meat to the skillet. Mix in the reserved tomato mixture into the meat, along with the raisins, capers and olives. Cook over medium heat, stirring regularly, until the mixture has thickened noticeably and is homogenous, about 10 minutes. Taste and season with salt, if you think it needs it. The Yucatecan "white sauce" (kol). While the meat is cooking, transfer 1 1/2 cups of the meat broth to a medium (3-quart) saucepan and set over medium heat. In a small dish, thoroughly mix the flour with 1/2 cup water. When the broth comes to a simmer, scrape in the flour mixture (most Yucatecan cooks pour it through a strainer set over the broth to avoid any lumps); whisk constantly until the broth thickens, about 5 minutes. Stir in the vinegar, then taste and season with salt, usually about 1/2 teaspoon. Finish the dish. Heat the oven to 350 degrees. Cut the cheese into slices a little less than 1/4-inch thick (If using a round of cheese cut the round in half, stand each half round on its cut edge and cut 6 half-moon slices out of each piece.) Line six 6-inch baking dishes (I like to use my Mexican earthenware queso fundido dishes, but small gratin dishes will work as well) with slices of cheese. Divide the pork filling between the dishes, spreading it to cover the cheese. Top with more slices of cheese, enclosing the filling. Bake until the cheese is beginning to brown, 15 to18 minutes. 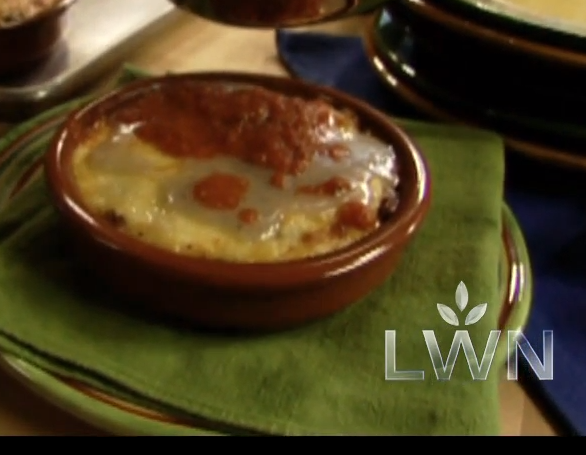 While the quesos rellenos are baking, reheat the tomato sauce and the white sauce. If necessary, thin the tomato sauce with a little water to give it the consistency of canned tomato sauce; if appropriate, thin the white sauce with a little water to give it the consistency of a cream soup. When the quesos rellenos are ready, spoon the white sauce over the top, then splash with the tomato sauce.